Went for a little road trip and pancake adventure to the Old Sugar Mill at DeLeon Springs State Park. Haven't been through DeLand for awhile - it's quite pretty on the main street now. A pretty cool place to walk around, but we just drove through that day. 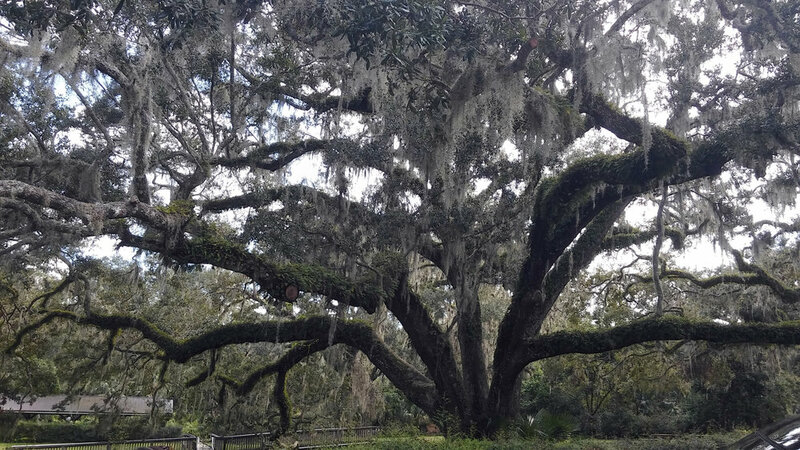 Mossy oaks as always in Florida. The Old Sugar Mill itself with the restaurant inside. Luckily we got a water view. You get to make your own pancakes - order the batter, the condiments and they bring the jug and off you go. Without the AC in the building even on the nice day outside it was pretty hot due to all the griddles running. I leaned back and drank plenty of iced tea. I'm not a fan of pancakes, so I ordered a chicken salad which was okay. Done eating - time to walk around and explore! Some parts were still quite flooded from the Hurricane Irma (it was November or so 2017 - couple months after Irma). Quite a few people were at the spring itself. It was one of the smaller parks I've been to. Not much to do - we spent may be one to 1.5 hrs there. Eastern European Customs: "Jeep Edition"